We are happy to officially announce our partnership with The Things Network, a global community responsible for building a decentralized data network, which allows things to connect to the internet without using 4G or WiFi. Moreover, the network is based on LoRaWAN, crowdsourced, and publicly available. Through our collaboration, we have already achieved some amazing things. Two years ago we gave LoRaWAN coverage to the whole city of Pisa. Last October we hosted The Things Conference Italy, where we welcomed developers from all over the world. The main topic of the conference was LoRaWAN and Python for IoT and industry 4.0 applications. This partnership and the combination of LoRaWAN and Python is bound to bring many more projects, events, and solutions. If you want to become a LoRaWAN expert join us at The Things Conference in Amsterdam, on January 31st and February 1st. 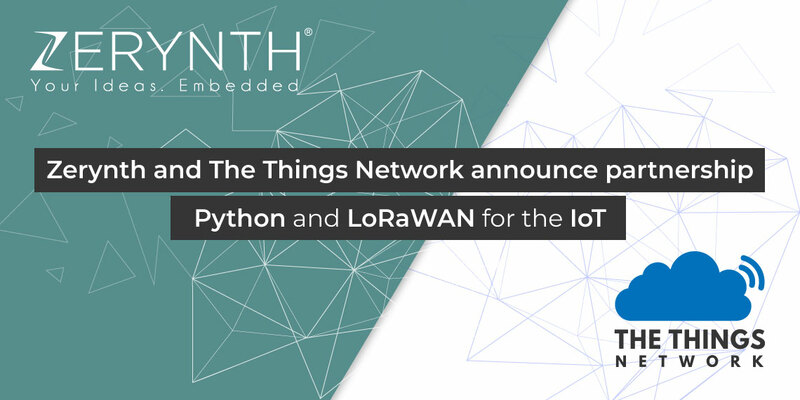 The Zerynth team will hold a workshop titled “Python and LoRaWAN: from “Hello World” to professional IoT applications”. In other words, we’ll show you how to develop LoRaWAN-based Industrial IoT applications using Python on 32-bit microcontrollers. Meanwhile, you can learn more about the workshop here. To get a 20% discount on the conference tickets use the voucher code: FRIEND-OF-ZERYNTH. Obviously, we hope we’ll see you there. The Things Network started in Amsterdam in 2015, and today it has expanded to over 800 cities around the world. This network enables new emerging applications, such as smart parking, remote monitoring, energy management among others. With over 5000 LoRaWAN gateways connected, there is ubiquitous connectivity across all the major cities of the world.